Oeffelt Ferry House from the opposite (Gennep) river bank. Nimwegen pub tycoons revive Ferry House in Oeffelt. The Ferry House in Oeffelt has been closed since September 2016, but will get bach its grandeur. According to Maarten Pillen and Arjen Gesterkamp from Nimwegen. The owners of the pubs Moenen and Camelot and the wine bar Pinot – all side by side on the Grote Markt in Nimwegen – bought the Oeffelt Ferry House on the river Meuse in June 2017 for about €600,000 / £555,000 to give it a new and an ambitious life. March 2018, the duo wants to reopen the doors of the Oeffelt Ferry House. Not only is the restaurant transformed into a café. “Of the seven hotel rooms, we want to make four independent holiday apartments. Without breakfast option, because in the Ferry House we want to have lunch and dinner. We will solve that with a small kitchen, and people may also go elsewhere in the region.” The Ferry House is intended to be open for the public seven days a week. With three pubs on the bustling Grote Markt in Nimwegen, the change to the outside area is great. “At first, we did not say a lot when people asked if something else was not something for us,” says Gesterkamp. “I’ve always called that I do not want to go back and forth by business, but that’s going to happen.” The pub tycoons were still looking for something new and coincided at the Ferry House. They immediately felt good at the white monumental building on the Oeffelt banks of the river Meuse. Also the ferry will be put to life again! It is a challenge. “A matter in the outlying area is something very different from the center of the city. Every place has its own peculiarities, and here is the challenge to make it attractive to sit in the winter months. The view is beautiful and you have peace and space, but it must be cozy enough to pull people to this terrace and to have the cafe survive in the winter,” says Pillen. In order to achieve that, according to Gesterkamp, it must in all cases be restored. “We want to retrieve the characteristic styles of this property and, of course, refurbish the exterior. But maybe we want to open the veranda again. In recent years, they have been closed by glass walls, “said Gesterkamp. Not only the property, but also the feelings and memories that residents of the region had at the place should be lived up to the new builders. “This must be a place for everyone and we want to give people the place they ever loved so much,” says Gesterkamp. The village also appears to have a need: regularly there are passengers to express their enthusiasm. August-27-2017: biking from Nimwegen to Oeffelt v.v. single way 24Km/18M. 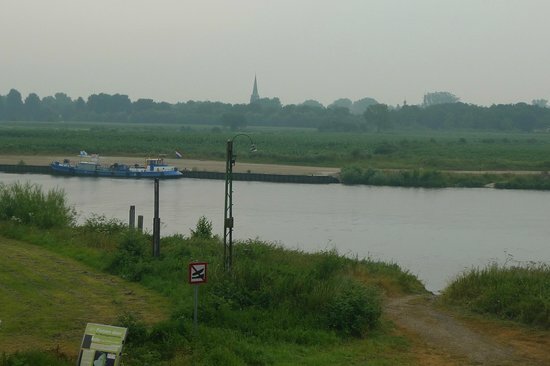 Nimwegen->Malden->Mook-> Plasmolen->Milsbeek-> Gennep->Crossing river Meuse -the frontier between provinces Limbourg and Brabant->1st street right: Ferry Avenue->Ferry House. This entry was posted in Documentation and tagged Veerhuis - Oeffelt. Bookmark the permalink.